Page elements are the things that are customizable on a per-page basis. Unlike the site-wide elements that are identical on every page, the page elements are what make each page unique. Page elements are categorized into two main sections, Hero and Content. 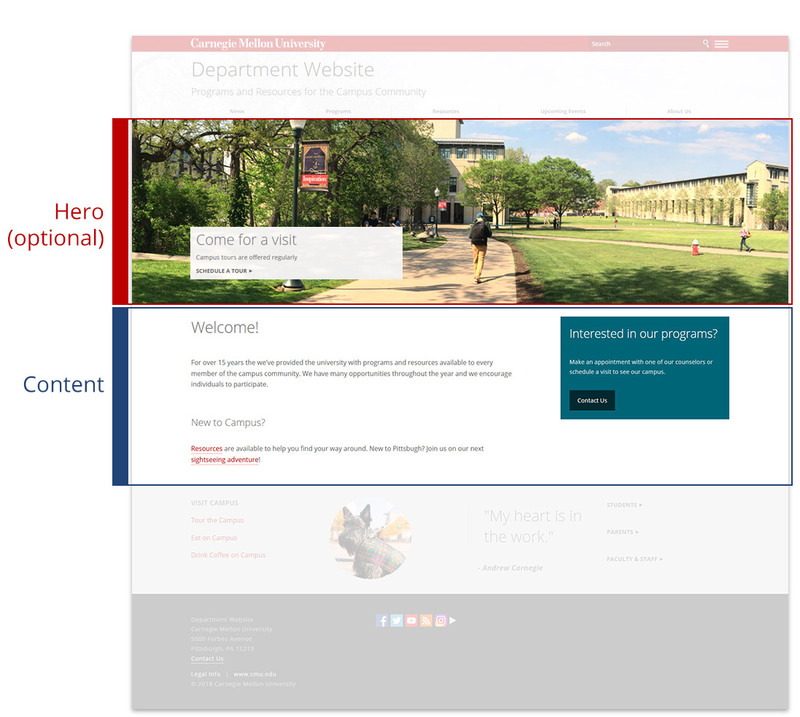 The Hero is a large visual that can be added to the top of any page. A Hero will make your page pop! And while not all pages need a Hero, we recommend using one on your home page and other highly visible pages to add visual appeal. Large visual that is a photo, news article, or silent YouTube video. Multiple photos and news articles (up to four) can be used for a rotating effect. Text overlay (optional) allows text and links to overlay the visual. Text overlay can be a text box (shown in example), centered text or a caption. The content is the heart of the page!